RePub, Erasmus University Repository: Supplementary physicians' fees: a sustainable system? 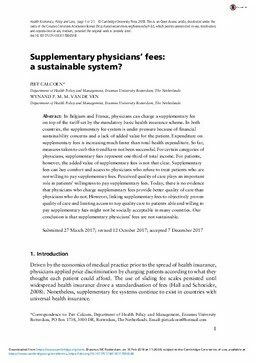 Supplementary physicians' fees: a sustainable system? In Belgium and France, physicians can charge a supplementary fee on top of the tariff set by the mandatory basic health insurance scheme. In both countries, the supplementary fee system is under pressure because of financial sustainability concerns and a lack of added value for the patient. Expenditure on supplementary fees is increasing much faster than total health expenditure. So far, measures taken to curb this trend have not been successful. For certain categories of physicians, supplementary fees represent one-third of total income. For patients, however, the added value of supplementary fees is not that clear. Supplementary fees can buy comfort and access to physicians who refuse to treat patients who are not willing to pay supplementary fees. Perceived quality of care plays an important role in patients’ willingness to pay supplementary fees. Today, there is no evidence that physicians who charge supplementary fees provide better quality of care than physicians who do not. However, linking supplementary fees to objectively proven quality of care and limiting access to top quality care to patients able and willing to pay supplementary fees might not be socially acceptable in many countries. Our conclusion is that supplementary physicians’ fees are not sustainable.